GABORONE, Botswana – Baseball and softball’s global growth continues as the World Baseball Softball Confederation (WBSC) today welcomed the African nations of Democratic Republic of the Congo and Tanzania as well as the Caribbean island of Sint Marten as the world governing body’s newest members, establishing officially recognised baseball and/or softball national governing bodies in these territories for the first time. The WBSC World Baseball Softball Extraordinary Congress at the Gaborone International Convention Centre (GICC) unanimously approved the membership of the Congo Federation of Cricket, Baseball and Softball (Fédération Congolaise de Cricket, Baseball et Softball), the St. Maarten National Baseball Federation and the Tanzania Baseball and Softball Association as the 182nd, 183rd and 184th WBSC Members. Increasing the bat-and-ball’s presence in Botswana, WBSC also welcomed Botswana Baseball as the 181st member, adding to the already established Botswana Softball Association. 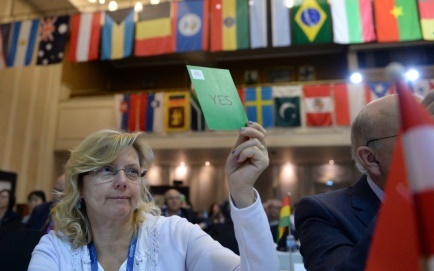 The WBSC Congress also ratified the expansion of Burkina Faso and Chilean baseball-only federations to include softball. The new members were welcomed with applause by the WBSC Congress. “The entire World Baseball Softball family congratulates and recognises our newest National Federations representing Botswana (Baseball), Congo, Sint Maarten and Tanzania for successfully establishing baseball and softball in their countries,” said an emotional and spirited WBSC President Riccardo Fraccari. “WBSC also congratulates our Burkina Faso and Chile members for expanding the sport with softball in their countries. “Today marks another historic moment toward the global development of our sport and achieving our mission of building a billion-strong baseball and softball community over the next decade, particularly as we take aim on Olympic inclusion in 2024 and 2028,” Fraccari added. Estimated populations of Congo, Sint Maarten and Tanzania are 78 million, 33,000 and 55 million, respectively. The WBSC Congress also approved the merger of the Korean baseball and softball associations into the Korea Baseball Softball Association (KBSA). The combining of baseball and softball federations follows the historic precedent set with the merger of International Baseball Federation (IBAF) and the International Softball Federation (ISF), which established the WBSC in 2013. Representatives of the Republic of Botswana, the Botswana Ministry of Youth Empowerment Sport Culture Development, the Botswana National Sport Commission as well as the senior vice president of the Botswana National Olympic Committee, Lieutenant Colonel Botsang Tshenyego, were in attendance at the WBSC Extraordinary Congress.